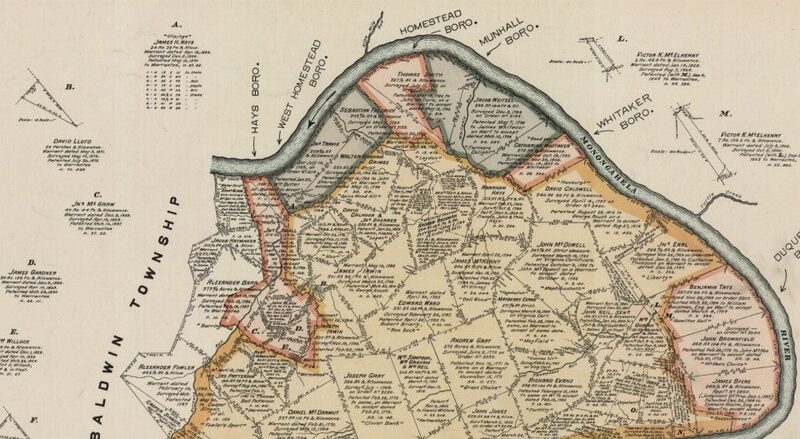 Map of early Homestead, PA. Notice Abraham Hays plot in the center-area of the map. After the great flood of February 10, 1832, there was nothing left of the original Hays homestead, which was located in the flood plain of the Monongahela River southeast of Pittsburgh. The flood stage of 38’2” was the third-highest recorded in area history at that time. The Hays family, most likely headed up by Jacob, Abraham’s fourth son and Jacob’s sons James Harden, Edward West, Thomas Harden and Captain Abraham Hays set about the cleanup and found a new location for their homestead. Eventually, they moved up the hillside and began construction of Harden Place, which was completed sometime between 1833 and 1841. 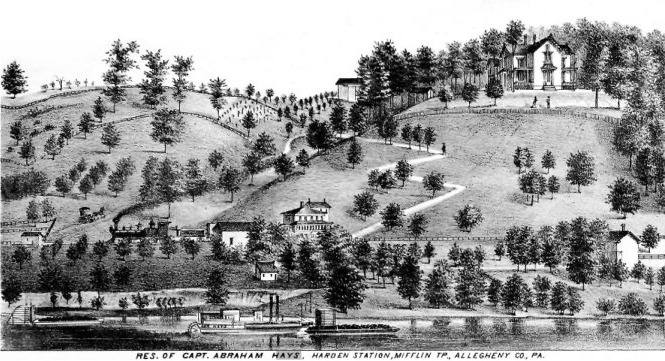 Captain Abraham Hays eventually became the owner of the mansion. His wife was Sarah Jane Brenneman Hays. Early painting of Hays Mansion and land. Many members of the Hays family were river men. In 1811, James Harden Hays and his brother Edward West Hays floated the first river ferry in Pennsylvania history at Six Mile Ferry, now known as Hays Borough. The borough is named after James Harden Hays, and the family name became synonymous with coal-mining, riverboats, among the other burgeoning industries of the period. According to family lore, James Harden Hays purchased a rice plantation prior to the Civil War in the bayous of Mississippi. The Hays river men would captain their barges down the Ohio and Mississippi Rivers to offload raw materials of coal, lumber and provisions. Returning with holds full of rice and runaway slaves, they would dock at Hays Station, Mifflin Township, a wharf below Harden Place, and offload the runaway slaves. The slaves entered tunnels that ended in the brick-lined basement of the mansion. Sarah Jane provided them sustenance and shelter while making arrangements either to move them north towards Erie, Pennsylvania and into Canada, or into the Union Army after President Lincoln allowed them access sometime around December 1862. African-American men were allowed to join only the Navy prior to that time. After the death of Captain Abraham Hays in 1887, William Seward Brenneman Hays inherited the mansion. W.S.B. Hays worked as a coal merchant in his early years for his uncle James Harden Hays, who had opened the first coal mine in Pennsylvania at Becks Run in 1824. Later in his career, he founded the W.S.B. Hays Coal Company and became the largest coal baron in western Pennsylvania. He married Flora Belle Packer in 1876 and they had two children, Abram Packer Hays and Flora Belle Hays. At age thirty-seven, Flora Belle died suddenly in 1890, and her sister, Lily Jane Packer, moved into the mansion to take care of the two children. Eventually, W.S.B. married Lily Jane in 1894, and they had two children together, Wilson Packer Hays, who died in infancy, and Seward Brenneman Hays, who was born in 1897. 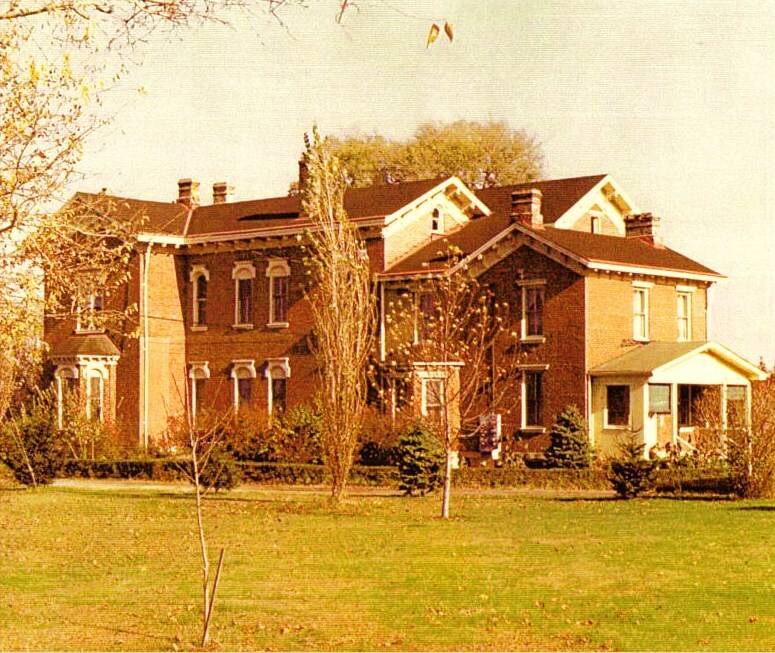 During W.S.B.’s lifetime, the Hays family made numerous expansions to the mansion based on the vast fortunes created as a result of the Industrial Revolution and the success enjoyed by the family in the businesses they owned supporting the steel industry. European artisans came to Pittsburgh to construct the mansion and its ornate Italianate Second Empire period architecture. W.S.B. died in 1924, and the mansion was inherited by his two sons, Abram Packer Hays and Seward Brenneman Hays. As Abram Packer Hays, Jr., recalled, his father, having no intention of living in the mansion, deeded his half-interest to Seward. Seward continued to live there and married Mary Bernice Beistel between 1925 and 1928. Their first child, Jane Harden Hays, was born in 1929. Their second, William Seward Hays, Sr. was born the following year. The family continued to live at the mansion and in 1973, Seward Brenneman died and the mansion descended to his son, William Seward Hays. William Seward Hays, Sr. married Alice Kathryn “Petey” Sipe on December 27, 1952. They had five children, William Seward Hays, Jr., born August 28, 1954; Abigail Packer Hays, born March 13, 1956; Rebecca Petit Hays, born September 1, 1957; Peter Sipe Hays, born March 27, 1965; and Maria Bernice Hays, born November 19, 1966. The family lived in Thornburg, a suburb of Pittsburgh and never resided at the mansion. William Seward Hays and Alice Kathryn “Petey” Sipe divorced around 1969 and William subsequently married Dorothy Marie Benatta Teny Morocco. In 1975, The Pittsburgh History and Landmark Foundation awarded Harden Place a historical marker. After two years of vacancy, William Seward Hays, Sr. began renovations and converted the second floor of the mansion into four apartments while keeping the first floor as a residence. They moved into the mansion in 1977. Upon Bill's death in 1992, Dorothy continued to live there until 1995. She ultimately sold Harden Place and eight acres surrounding the mansion to Hardin Place, Inc., a corporation owned by Pittsburgh businessmen Michael S. Marchese and Gregory J. Baurnes on September 27, 1995.